AMBROSE (AMBROSE, AMBROSIUS), historically counted as the thirteenth, though many traditions number him as sixteenth, Bishop of Cahors in Aquitaine. The period of his episcopacy was quite tumultuous, and St. Ambrose was forced to quit his See in fear for his life more than once. St. Ambrose finally retired to spend the rest of his life as a hermit near Borges. St. Ambrose he reposed at what is now called Saint-Ambroise-sur-Arnon in Berry circa 752, soon after returning from a pilgrimage to Rome. BALDERIC (BAUDRY), the founder and first Abbot of Montfaucon-d'Argonne Abbey in Loraine. 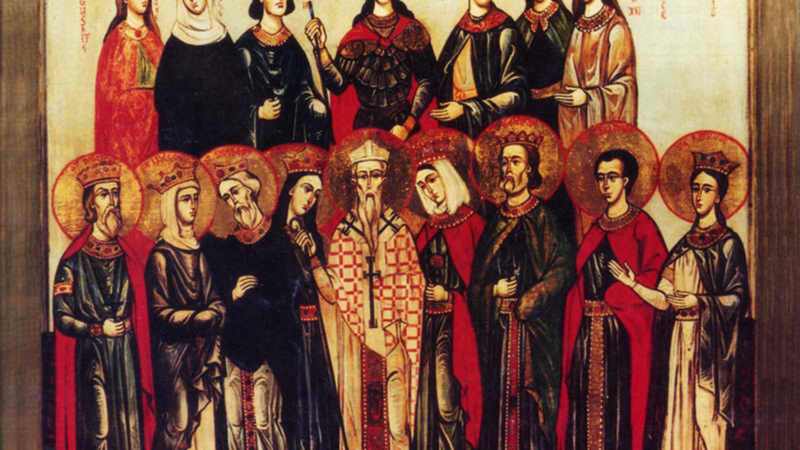 St. Balderic and his sister, St. Bova (24th April), were children of Sigebert I, King of Austrasia. Several years after founding Montfaucon, St. Balderic founded Saint-Pierre-les-Dames Abbey in Reims with St. Bova as the first abbess. St. Balderic was the spiritual father of St. Wandrille 22nd July, who spent a decade of his early years in monasticism at Montfaucon. St. Balderic reposed circa 640 at Reims whilst visiting his sister. BALDWIN (BAUDOIN), Archdeacon of Laon, son of St. Salaberga (22nd September), and brother of St. Anstrudis (17th October). He was murdered, possibly by order of Ebroin (the despotic Mayor of the Palace of Neustria), circa 680, and subsequently venerated as a martyr. BERCHARIUS, following his education under St. Nivard (1st September), Archbishop of Reims, St. Bercharius entered Luxeuil Abbey. Returning to Rheims, he prevailed upon St. Nivard to found the Abbey of Saint-Pierre of Hautvillers, with St. Bercharius as its first Abbot. During his tenure as Abbot St. Bercharius also founded the Abbey of Montier-en-Der (for men) on land he had inherited, and Pellmoutier, Puellarum Monasterium (for women). in the Diocese of Châlons-sur-Marne near Reims. In 696 St. Bercharius was mortally wounded when stabbed by a monk he had reprimanded, when the offender was brought before him rather than condemn the monk, he simply told him to go to on a pilgrimage to Rome where he should seek absolution. St. Bercharius reposed two days after he was stabbed and was subsequently venerated as a martyr. BOLONIA, a fifteen-year-old girl martyred under Julian the Apostate in 362. No further information seems to be extant. CONOGAN, a Breton saint whose life is sorely lacking in verifiable details. Possibly a native of Wales, St. Conogan is generally said to have been the second (or third) Bishop of Quimper in Brittany, succeeding St. Corentinus (12th December). St. Conogan reposed in 460. DULCIDIUS (DULCET, DOUCIS, DULCIDE), the fifth Bishop of Agen, succeeding St. Phaebadius (25th April). He is remembered for the fervour of his worship, charity and care for the poor and the sick, and defence of the faith against Arianism. St. Dulcidius reposed circa 450. ELIPHIUS (ELOFF, ÉLIPHE), a native of Ireland who was martyred in 362 in Toul under Julian the Apostate (the Acta Sanctorum states on Julian's personal orders). His relics were translated to Great St. Martin Church in Cologne in the tenth century. EREMBERTA, (Seventh Century), a niece of St. Wulmar (20th July), and first Abbess of Wierre-au-Bois Abbey in Pas-de-Calais, which was founded by St. Wulmar. FLORENTINUS of TRIER, a fourth century Bishop of Trier, the successor of St. Severinus (21st December). No further information on his life is extant. 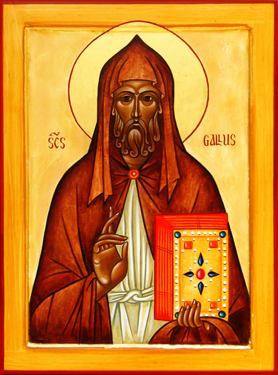 GALL (GALLUS), a monk at Bangor and one of the twelve disciples who accompanied St. Columbanus (23rd November) to France. A distinguished scholar of the scriptures, he helped in the founding of Luxeuil Abbey in Burgundy. Exiled by King Theodoric, St. Gall settled in present-day Switzerland where the monastery and town of Saint Gall later grew up. He reposed circa 645, and is venerated as one of the Apostles of Switzerland. JUNIAN, (Fifth Century), a hermit at Comodoliac in the Limousin region of present-day France, which is now called Saint-Junien after him. LULL (LULLUS, LUL), a monk at Malmesbury Abbey in Wiltshire, who joined St. Boniface's (5th June) mission to the Germans. St. Lull was consecrated bishop 751–52 by St. Boniface to serve as his auxiliary, succeeding St. Boniface as the Archbishop of Mainz, 754. St. Lull reposed 787. MAGNOBODUS (MAINBOEUF), a Frankish noble, chosen by popular acclaim to serve as (seventh?) Bishop of Angers in Anjou. St. Magnobodus reposed circa 670. MARTINIAN, SATURIAN, and COMPANIONS, four brothers who were slaves of an Arian Vandal in Mauritania (the Mediterranean coast of present-day Morocco). They were martyred in 458 during the reign of the Arian Gaiseric, King of the Vandals (r. 428–477), by being dragged by horses. MARTYRS of NORTH-WEST AFRICA, a group of two hundred and twenty Christians martyred in north-west Africa. There are no further details extant. MUMMOLIN (MOMMOLINUS), a native of Constance Switzerland, who received monastic tonsure at Luxeuil. He later spent time at Abbey of St. Bertin in Saint-Omer, and served as Abbot of Sithiu (later Saint-Omer) before being consecrated Bishop of Noyon-Tournai in 660–1, serving until his repose circa 686. SATURNINUS, NEREUS, and COMPANIONS, a group of three hundred and sixty-five orthodox Christians, in the present-day area of Tunisia and Algeria, who were martyred in 450 during the persecutions under the Arian Gaiseric, King of the Vandals (r. 428–477). VITALIS (VIAL), a native of England who received monastic tonsure at Noirmoutier, and later as a hermit on Mont Scobrit near the Loire River. He reposed circa 740.